Windows Product Key Viewer is a free utility that will display the installed Windows Product Key (cd key) and other important Windows system information. Our Windows Product Key Viewer works with all Windows operating systems (95, 98, ME, NT, 2000, 2003, XP, Vista, 7, 8, 2008, 10), 32-bit and 64-bit. We allow you to save this information to a text file, copy the key code or print the Windows informaiton for later use. Including the Windows product key, we also display the full Windows version, service packs, product id, installation date and time, registered user, VMWare and organization and the current Windows uptime. Windows Product Key Viewer is great if you ever need to find out your Windows product (CD) key. Windows does not provide a way to view the installed product key. If you have lost your key or the registration card that it is printed on, you are out of luck. Re-installing Windows requires you to have the original product key. Fortunately you have our Windows Product Key Viewer to help. 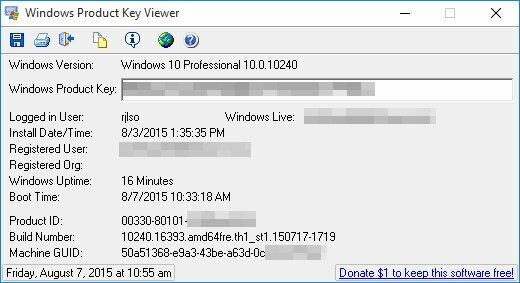 Click here to download Windows Product Key Viewer v1.07 .